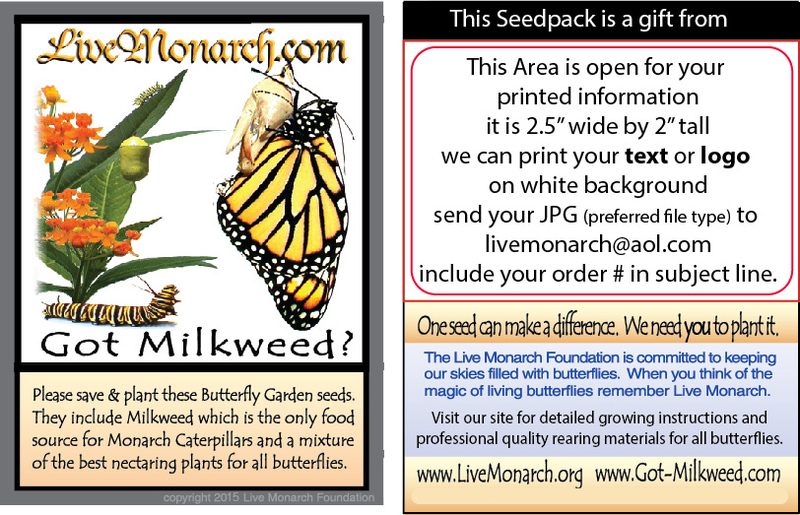 Personalized Seed Packs Show your support! 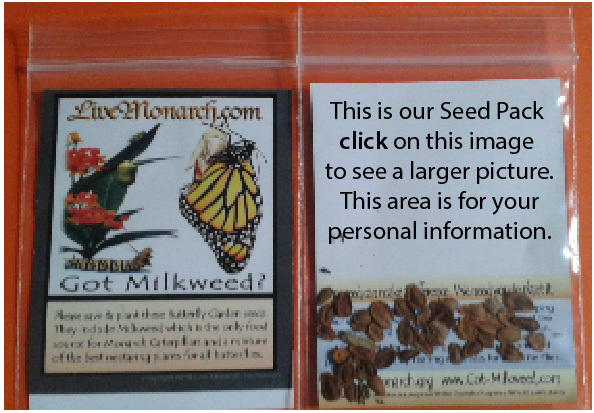 A wonderful personalized Butterfly garden seed pack. Give your friends, clients or customers a thank you gift that will be saved and always remembered. A perfect fundraiser too if you need fast funds. You can easily raise $50 or even $1000 with very little effort. With every sighted Butterfly your gift will be appreciated all the more. Learn more click here. Our seed pack contains the best mix of plant seeds to feed both caterpillar and adult butterflies. For as little as 40 cents a pack, your gift is a wise investment. 20-99 personalized seed packs 50 cents each. 100-199 personalized seed packs 47 cents each. 200 or more are just 45 cents a piece! 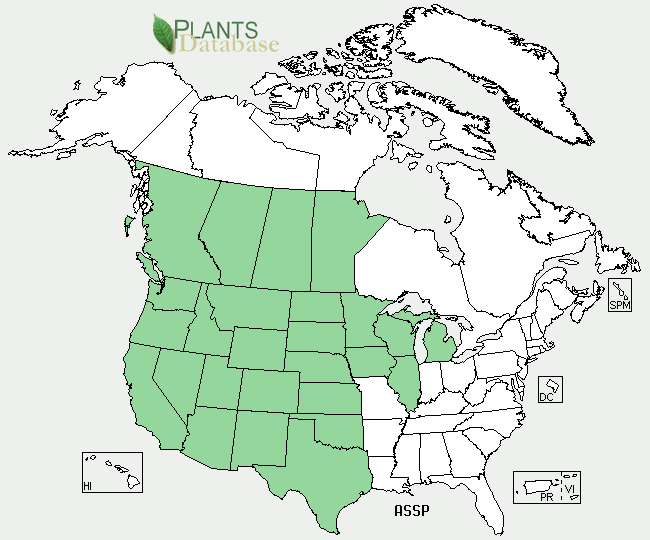 Want seed packs with only our information? They will only have our basic design similar to what is pictured. No Yes click picture for up close view. Feel free to send us a JPG file with your logo or picture on a white background, photographs do not work well due to color changes and resizing. Unless very complicated there is no set up charge... WOW!!! Extra garden seeds are availiable for your region and purposes see below. Please call us with new ideas and special needs. Schools, realtors, small shops, gifts, fundraisers, even local government. Everyone Loves the personalized seed pack. click on the picture for a close up view. "It was one of our most appreciated gifts to our community" - City Chairperson Coconut Creek, Florida. 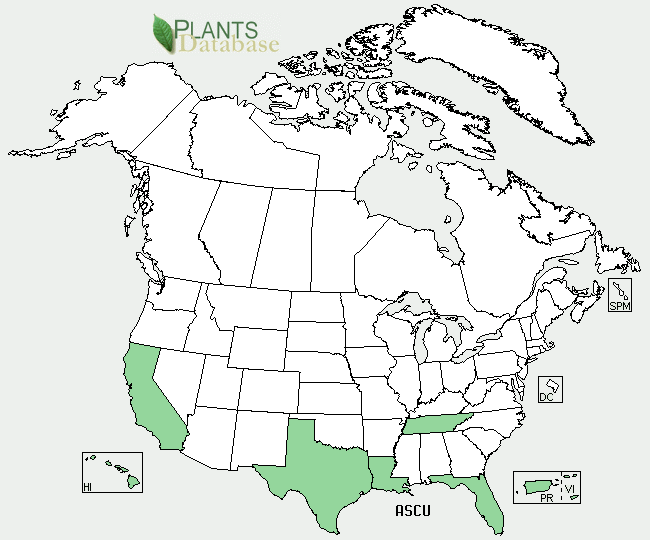 They handed out 5,000 personalized and sponsored seed packs at their "Butterfly Capitol Of The World" festival. 30,000 seed packs sponsored by local businesses. Renfest Giveaway...best take home item. Please type your personalized seed pack message here. If you want a color logo or picture please fill out the order form, include your directions in this box below and email us your picture file with your order # and "seedpack picture" in the subject line. Need Extra seeds? Well we have them! Buy the 1/2 ounce pack and share with friends. Need a pound or more call us. 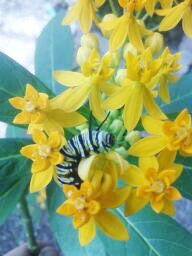 Half ounce Southern Milkweed $15.00 (Aprox 3,000 seeds) Asclepias Curassavica red and orange flowers, grows quickly but will not survive hard freeze. Half ounce Northern Milkweed $25.00 (Aprox 2,000 seeds) These are in very short supply and may be either Asclepias Syriaca or Asclepias Speciosia depending on current availability. (Update July) due to strong demand we have purchased the entire supply of two of our long term producers of Northern seed. This unusually high demand has nearly doubled our costs to acquire seeds and as a result we were forced to raise prices accordingly. We hope to remain your lowest cost choice for high quality seeds and will adjust prices as our costs change. Half ounce Mixed flowers for butterflies includes milkweed $11.00 (Aprox 7,000 seeds) click link for list of 25 types of seeds in this excellent mix. 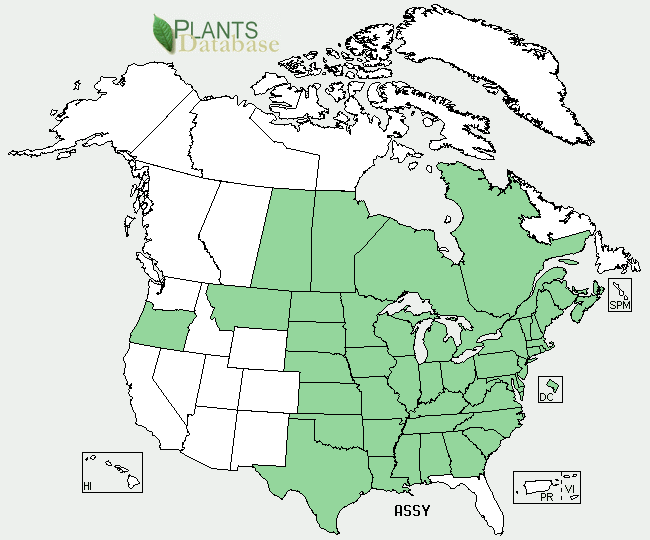 Has both Northern and Southern Milkweed too. The most seeds and the most economical way to create a natural refuge for a wide variety of butterflies and habitat for many other creatures as well. We support local producers and hope you seek out native varieties. If you can not find a local supplier or resource become one. Share your knowledge, plants and seeds. Asclepias-curassavica - This is hands down the favorite egg laying and food plant of Monarchs. This is the only type we offer as pregrown plants. Fast growing it produces as many as 1,000 seeds per plant to save and share. Use as a backup resource when local varieties are exhausted. The seeds we supply are ready to plant with no special preparation necessary, soaking seeds for a few hours will quicken germination. <8 day germination at 70F. 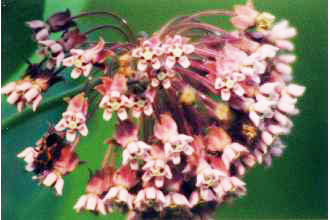 Asclepias-syriaca - also know as common Milkweed this was once the major diet of the Monarchs. A 4' plant with large thick leaves that feed many Monarchs. Will survive winters and a prolific seed producer. We ship this type first until our supplies are exhausted then switch to speciosa for Northern regions. Germination is variable dependent on source. typically >13 days. Seed testing shows full germination takes place even after 30 days. Soaking seeds for a few hours will quicken germination and is highly suggested. 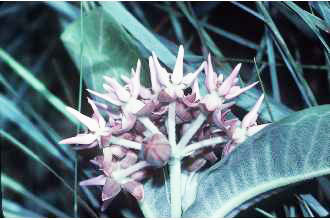 Asclepias-speciosa - A beautiful plant up to 4' tall with large thick leaves that feed many Monarchs. Will survive winters and a prolific seed producer. The seed we supply are ready to plant no special "stratification" necessary. >14 day germination. Seed testing shows full germination takes place even after 30 days. Soaking seeds for a few hours will quicken germination and is highly suggested.